The success of Seasonal Films’ first big money spinner is due to the merits of Ng See-yuen’s ensemble cast. A deluge of young talent run wild in an era of Shaw Brothers pot-boilers and Bruce Lee clones. 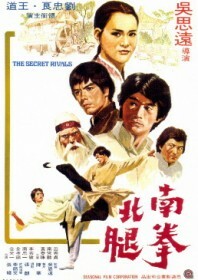 The refreshing legwork of HK debutantes Hwang Jang-lee and John Liu is enough to bring on a hot flush, introducing to the world the caricatures they would later embody: Hwang as the hippy-haired so-evil-it-hurts Northern Leg meanie Silver Fox, and John Liu as his stony-faced, do-gooder antithesis. Wong Tao, another relative newcomer, buffs up nicely as the womanising Southern Fist protagonist who, in this instance, enters a concocted kung fu competition with Liu to find a suitable scapegoat to supervise the Lord’s evil shenanigans. The story completely wanders off at points, leaving the cast to act mostly with their feet until the fighting becomes so routine you start to consider turning off the subtitles. The final bout is the film’s clincher: a customary two-on-one involving some of Tommy Lee’s best choreography, Yuen Biao‘s best acrobatics and a trio of great performers on top of their game. There is a reason why this film features so prominently on most aficionados’ wish lists. It’s a stroke of genius.